"War Movie Shows the Psychological Impact of War"
Quality: Content: -2 "EXTREME CAUTION"
In JOURNEY’S END, a company of British soldiers is sent to defend a trench against the Germans on the front lines during World War I. JOURNEY’S END encompasses a major event of the war, but it focuses much more on the personal turmoil of the soldiers as they face the loss of love and life. Foul language, mature content and some intense scenes warrant extreme caution, especially for children and teenagers. JOURNEY’S END, based on the 1928 play and subsequent novel, tells the story of the British Army’s C Company as they’re sent to the front lines in World War I in early 1918. For several months the British have been manning a series of trenches in Northern France, waiting for an inevitable German attack to commence. The two armies have been in a stalemate only a few hundred yards from each other. Every six days the British rotate through a fresh batch of soldiers in the trenches, and none of the soldiers know if they’ll be the ones stuck in there when the Germans attack. To make matters worse, there are no plans for reinforcements, so the soldiers in the trench are on their own. Raleigh, a 20-year-old officer fresh out of school, looks up his uncle who’s a general in charge of assignments. Raleigh asks to join C Company where his old friend, Captain Stanhope, is serving. Stanhope was his head-boy in school and is also his sister’s expected fiancé. The general reluctantly grants his request, knowing that C Company is being sent to the trenches. When Raleigh arrives, he’s surprised to be confronted with a miserable, war-weary version of Stanhope instead of the bright, carefree companion who used to play in the fields with him and his sister back home. Stanhope’s repeated brushes with death and destruction have shaped him into a cynical alcoholic, which he tries to hide from Raleigh. Though Raleigh figures it out, he never lets on that he knows and only writes good things home to his sister about Stanhope. Lt. Osbourne, a middle-aged headmaster, who used to play professional rugby, takes Raleigh under his wing. He’s seen by the company as a father figure, and he does his best to keep Stanhope under control while preparing Raleigh for the challenge of leading troops in battle. They find out that the German attack is coming during their watch, which sets off a series of psychological wars between soldiers as they face the reality of their situation. To top it off, the company is ordered to conduct a daylight raid of the German line and bring back a German prisoner in hopes he’ll divulge information about the impending attack. Raleigh and Osbourne are chosen to lead the small team, with Raleigh seeing his first action in the war. Osbourne is killed, leaving Stanhope in charge of the company, and a much more war-weary Raleigh as they await what is to be a sure death. JOURNEY’S END is based on a 1928 play and subsequent novel, both of which performed well in their day. It is less a war movie and more of an exploration of a soldier’s mind as he matures from an inexperienced go-getter, to a jaded veteran, to a resolute leader. The movie is entirely a drama until three-quarters of the way through when the raid occurs, and the German attack doesn’t commence until the very end. Its purpose is not to show war itself, but the affect war has on the human spirit. Each main character is given a personality, a family and their own personal war to wade through as the larger one threatens the whole of Europe. While it does seem to be moving slowly in a couple of places, it’s never truly boring and succeeds in making the viewers nervously wonder when the attack is going to happen themselves. For a war movie, JOURNEY’S END is quite tame and not nearly as graphic as war movies tend to be these days. Perhaps, it’s British propriety that sets the tone. After all, the officers are enjoying wine over dinner in the trenches, decked out with ties and dress coats for uniforms. The amount of foul language is moderate, using the “f” word and “bloody” sparingly. The violence is also moderate, showing injuries and death, but never anything really graphic. The filmmakers preferred to depict the mental scars of war more so than the physical. Vomiting and urinating do briefly occur, as well as plenty of pipe and cigarette smoking throughout the movie. One scene briefly shows a picture of a naked woman on the wall of the trenches. Extreme caution is warranted, especially for children and teenagers. One scene depicts a soldier lying to another and invading privacy and a few scenes depict intense arguments between soldiers. 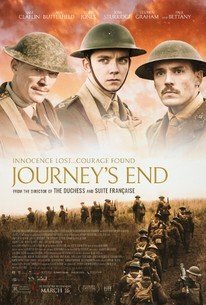 JOURNEY’S END, tells the story of the British Army company on the front lines of World War I in 1918. Raleigh, a 20-year-old officer fresh out of school, asks to join C Company so he can serve with his old school buddy, Captain Stanhope. He finds the war-weary Stanhope nothing like the carefree friend he knew. When the company commander’s killed, Stanhope must overcome his grief and alcoholism to lead the men in battle. Meanwhile, Raleigh’s forced to deal with the shock of war. Based on a 1928 play and novel, JOURNEY’S END is less a war movie and more of an exploration of a soldier’s mind as he matures from an inexperienced go-getter, to a jaded veteran, to a resolute leader. The movie waits until the end to show the war itself. Its purpose isn’t to show fighting, but the effect war has on the human spirit. Consequently, JOURNEY’S END isn’t nearly as graphic as other such movies. That said, there’s some foul language, intense scenes and a naked woman’s photo. Strong caution is warranted, especially for children and teenagers.